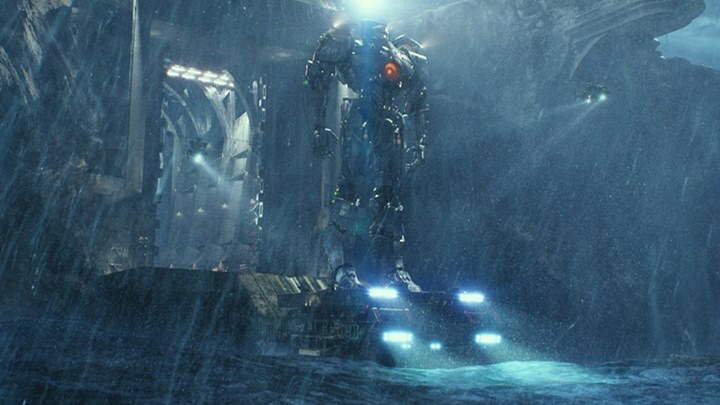 Guillermo del Toro’s robot vs. monster blockbuster crashed into theaters this weekend. Toro is known for a variety of of films, ranging from animated family movies, to horror, and fantasy. It’s really interesting that he can have his hands on such varied material. One year he is directing Hellboy, the next Pans Labyrinth. His offering to theater goers this summer from his latest film delivers for mech and science fiction fans. A portal in the bottom of the pacific ocean opens and giant monsters (Kaiju) emerge and wreak havoc on mankind. The world truly comes together for the first time to combat the invaders. The world’s most talented engineers and minds collaborate to invent colossal human shaped mechs. These mechs are controlled by humans in real time. To alleviate the mental strain of this connection to the Jaeger, two pilots sync their minds together and share the load. The story is cheerful and generally upbeat. The film goer is presented with some amazing action sequences and fights. I didn’t watch the film in 3-D but I was thoroughly entertained by the action. It was fast but not too fast that I couldn’t keep up with it. Plot and character developments come at a generally acceptable pace. The story never becomes too gloomy or have too many highs or lows. The visual aspect of this film was one of its highlights. The movie felt grounded despite it’s large use of computer generated imagery. The backdrops never felt too green-screeny and there were actually some very cool sets. The ambient lighting in Hong Kong in particular was superb. Idris Elba brought some good acting to the film in a role he is becoming known for; The Zen-Master like authority figure/leader. And we get his british voice –a nice change from the norm. Some of the comedic relief from Charlie Day(Always Sunny in Philadelphia) seems a bit too much at times but it works in most cases. The best performance in my opinon came from Rinko Kikuchi. Her character Mako is quirky, shy, demanding, and full of vengeance;all at once. How she pulls it off?, I’m not so sure but its really entertaining to see her interact with the other cast members. And of course we get a cameo from Ron Pearlman as a black market vendor for Kaiju parts— a sort of signature addition to the cast from Guillermo del Toro, that got plenty of laughs from his fans.The dialogue of the characters wasn’t revolutionary or exceptional in anyway but it was just so fun to let go and watch the story unfold. In many ways this experience felt like I was watching a live action anime movie. The inner geek in me took hold. Mechs? Check. Monsters? Check. Akward romances? Check. Bizarre and at times stereotypical personalities? Check. The film was exciting and managed to keep me entertained for 2+ hours. Go to see it. It’s surprisingly satisfying and has the potential to be del Toro’s new big franchise. This entry was posted in Movie Reviews and tagged acceptable pace, anime, computer generated imagery, giant monsters, Guillermo del Toro, Idris Elba, movie, movie reviews, Movies, Pacific Rim, pans labyrinth, Review, Rinko Kikuchi, sci-fi, science fiction fans, theater goers. Bookmark the permalink. Good review Tim. Had a fun time with this one, even if I was a bit disappointed by how lame the characters were. Thanks for reading man. Yeah the majority of characters were one dimensional but for some reason I didn’t mind. Think it’ll be a sequel?